Depending on your location, you’re probably starting to see early signs of spring. The nicer the weather and signs of new life seem to make people want to spruce up their surroundings. 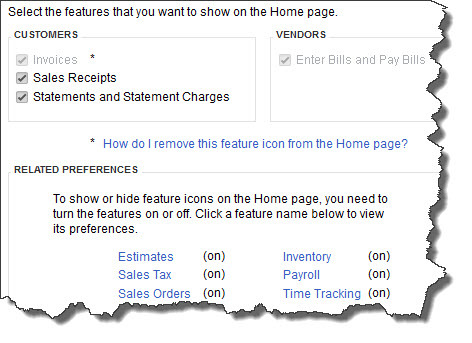 To reduce the number of feature icons even more, go to the Finance Charge, Jobs & Estimates,Payroll & Employees, Sales & Customers, Sales Tax and Time & Expenses. 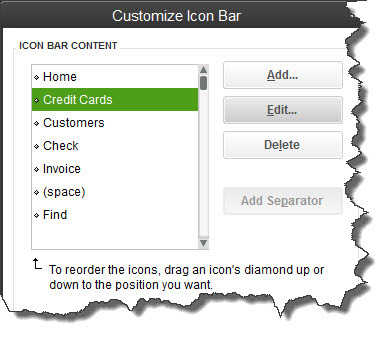 QuickBooks removes the related icons and reroutes the process map on the home page. Figure 3: Your icon bar can be your fastest route to often needed screens — if you modify it to only contain the functions you use, in order of importance. You can also change the labels to make them more meaningful to you. Trim down your icon bar. Seems like a minimal change, but it’s one of those things that can add unnecessary moments of frustration throughout the day (“Where’s theCalendar!“) Click View | Customize Icon Bar. The most critical spring cleaning task is company file analysis and maintenance. We can handle this for you. 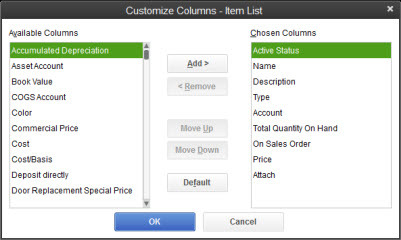 QuickBooks can slow down and start generating error messages when the data file becomes unwieldy and sloppy. Preventing file corruption before it crashes your system is a lot faster and less expensive than a reconstruction project. So if you have any questions about this, give us a call today. When it comes to funding a child’s college education, Section 529 plans are a no-brainer. You can contribute regardless of income level, and contribution limits are high. Although you contribute after-tax dollars, all withdrawals — including earnings — will be free of federal income taxes as long as they’re used for qualified postsecondary education expenses. Some states even offer their residents a tax deduction for using their home state’s plan. Prepaid tuition plans allow you to lock in tomorrow’s tuition costs at today’s prices. Typically used for in-state public universities, they can, in most cases, also be used to pay out-of-state or private college tuition. 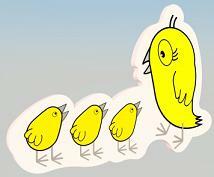 Prepaid tuition plans cover tuition only, not room and board or other expenses. Savings plans enable you to save for all qualified educational expenses. They’re managed by an investment company and range from conservative to aggressive. Some plans offer age-based options in which portfolios become more risk-averse as the child gets closer to college. You’re allowed to participate in any state’s plan. But before choosing, research several plans’ investment strategies, historical performance, risk characteristics and fees. Like inflating income tax deductions, padding expense account reports is something everyone knows is wrong, but many do anyway. According to the Association of Certified Fraud Examiners’ 2012 Report to the Nations, expense fraud makes up 15% of all occupational fraud cases. And while each incident may seem minor, the median annual loss for surveyed companies was $26,000 — a loss few businesses can afford. To stop expense padding, you need to know how it works. Expense inflation — where an employee exaggerates the amount of the actual cost of a meal or cab ride and pockets the change — may be the most common expense-padding method. But cheaters are also capable of inventing expenses and submitting fake documentation to support them or requesting multiple reimbursements by submitting the same receipt more than once. And watch out for mischaracterized expenses. In such schemes, employees provide legitimate documentation for non-business-related expenses, such as treating friends to a night out on the town, and characterize them as “business development” costs. By scrutinizing expense reports and supporting documentation for inconsistencies, “bad math” and receipt doctoring, you’re likely to catch some of the less-sophisticated cheats. But if the problem is widespread or its perpetrators are experienced, you may need to hire a fraud expert to conduct a thorough investigation of expense records, interview suspect employees and gather evidence needed to fire, and perhaps prosecute, guilty parties. A fraud expert can also help you develop policies and processes that prevent expense fraud in the future. For example, if you’re still relying on paper reports, switching to an electronic reporting system may make it harder for employees to cheat. At a minimum, you’ll want to set some limits, such as requiring employees to fly coach class, stay in moderately priced hotels and adhere to a daily meal expense allowance. Also specify the types of supporting documents you’ll accept — for example, original receipts, but not credit-card statements. Don’t let employees bleed your business dry with paper cuts. Thoroughly review their reimbursement requests and, if you suspect large-scale losses or a systemic problem, call in a fraud expert. Companies without a disaster recovery or business continuity plan only need to consider the aftermath of last November’s Hurricane Sandy. Property damage and business interruption losses are estimated at more than $50 billion, and many businesses in the affected region are still struggling to clean up, rebuild and reopen. Although most natural and manmade disasters are unavoidable, companies can take steps to protect employees, minimize loss of data and recover costs. A business continuity plan can reduce financial losses and facilitate a faster recovery, whether you experience a fire, earthquake, power outage or even a flu epidemic. People. Assign a point person (as well as backups) who’ll be responsible for ensuring all employees are safe and accounted for — whether they’re at work or home. This person should keep an up-to-date list of employees’ phone numbers, e-mail addresses and next-of-kin information. He or she might also be in charge of evacuating your office or facility. Be sure to designate an offsite place for employees to meet and provide a central contact number so staff members can check in. Information technology. To help ensure your company stays open when servers and other physical equipment are damaged or destroyed, back up e-mail, data and software offsite or online. Online backup or cloud computing services are secure and affordable. Following a disaster, they enable you to restore data from a remote location. And with a Web-based e-mail system, you can continue to communicate with employees, customers and vendors during the recovery period. Insurance. Review your company’s coverage. Does it provide enough to replace lost assets, restore operations or, if necessary, relocate? Remember to account for such intangible losses as destroyed intellectual property, nonexistent sales or undelivered products. And be sure to read the fine print. Coverage for damage caused by flooding following a hurricane, for example, may not be covered under a standard policy. It’s not enough to create a disaster plan — you also need to review, revise and test it periodically. Hold regular fire and other evacuation drills and ask employees to update personal contact information. At least once a year, ensure that your IT backup systems are functioning properly and that your insurance coverage is keeping pace with the value of your business. By making business continuity an ongoing process, you and your employees will be ready to act should the worst happen. It’s 2013: Do you have a new tax strategy? Congress’s Jan. 1 tax deal saved the country from falling off the “fiscal cliff,” but it also introduced many new — and potentially confusing — changes to the tax code. Although you’ve likely heard about the American Tax Relief Act of 2012 (ATRA), you may not know how it affects your personal and business taxes. Here are some of the highlights. The most notable change may be higher income tax rates for upper-income filers starting in 2013. If you’re single with taxable income exceeding $400,000 or married filing jointly with income over $450,000, you’re now subject to a 39.6% maximum rate. ATRA also reintroduces limits on personal exemptions and certain itemized deductions, with thresholds of $250,000 for singles and $300,000 for joint filers. Among the big stories for businesses are extensions of 50% first-year bonus depreciation and enhanced Section 179 expensing. Sec. 179 allows your business to elect to expense (rather than depreciate) the full cost of qualified property placed in service during the tax year. Such expensing is subject to an acquisition limit and a phaseout — before ATRA, the 2012 limit was $125,000, with a $500,000 phaseout threshold. ATRA extends through 2013 (and retroactive to 2012) a previous $500,000 limit and $2 million threshold. And up to $250,000 of the limit can be for the cost of qualified leasehold improvement, restaurant and retail improvement property. So if you’ve been thinking of making such improvements, consider incurring the expenses this year. To ensure you take advantage of any opportunities and minimize negative consequences, talk to your tax professional as soon as possible. And be sure to stay in touch. If 2012 taught Americans anything, it’s that further tax changes are likely in store. Among the provisions of the American Taxpayer Relief Act of 2012 (ATRA) are changes to the alternative minimum tax (AMT). Many middle-income taxpayers were at risk of owing AMT for the 2012 tax year. But ATRA permanently reinstates the AMT “patch” — not only for 2013 and future years, but retroactive to Jan. 1, 2012. The new law increases AMT exemption amounts for 2012 and calls for them to be indexed for inflation for future years. Retroactive to the beginning of 2012, ATRA also permanently allows individuals to offset AMT (and regular tax) liabilities with various nonrefundable personal credits. These changes are expected to help approximately 30 million additional taxpayers avoid AMT liability. However, many individuals will still be subject to the tax.